For over 50 years, Generac has been a leader in innovative design and superior manufacturing of home standaby generators. When it comes to developing products that are both durable and reliable Generac stands head and shoulders above their competition. The result of Generac’s efforts can be seen across the complete range of home, commercial, industrial, mobile and portable generators. Our group of professionals at Ohio Generator Experts achieved Ohio's 1st Five Star Generac Dealer as a direct result of our complete generator service including assessments, repairs, warranty, installation and maintenance to homes and businesses, and it all starts with a Free Assessment. We provide a Free Industrial Facility Generator Assessment service to businesses in the Cleveland & Northern Ohio area and would welcome the opportunity to provide you a Free No-Hassle Industrial Generator Assessment for your facility needs. 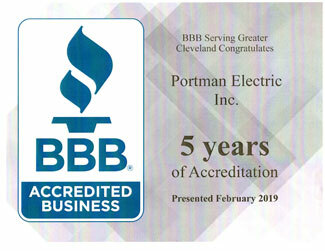 Portman Electric is committed to providing superior electrical services for industrial, commercial, and construction businesses. The valuable advantages we can offer are selecting the proper sizing for your commercial generator requirements in Cleveland & Northern Ohio areas, our great service - licensed electrical and gas hook-up service, high-quality products, and experienced workers at a competitive price. As a family owned and operated business we provide our services for the many cities of Northern Ohio; Cleveland, Akron, Canton, Warren, Sandusky, Elyria, Mentor, Parma and Ashtubula, as well as, all areas in-between since 1998. Your backup generator is responsive. Industrial generators are a great secondary source of stand-by or emergency power. Generac has driven innovation in the industry by considering generators from a unique perspective—yours. The best of both worlds, strong 15.2L diesel engine starting power combined with the longevity of gaseous fuel for extended run times. Since Generac Bi-Fuel™ generators run primarily on natural gas, which is cheaper than diesel, fuel costs are significantly reduced over the long term. And since every component is manufactured in-house, these generators are EPA-compliant from the factory. With a reduced carbon footprint, these generators help meet businesses achieve their eco-friendly goals. This disruptive technology starts with a strong 18.13L diesel engine that transitions to gaseous fuel as load is applied, providing 600 kW. 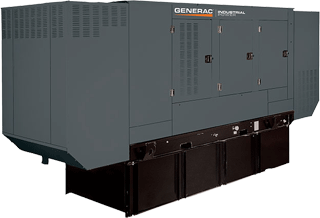 Generac Bi-Fuel™ generators meet the on-site fuel requirements for emergency systems as referenced in NEC700 and NFPA 110, and they have the only EPA compliant engine right from the factory. Since less diesel is used, they have fewer emissions and a smaller carbon footprint compared to diesel only. Revolutionary and reliable, our 350 kW diesel generators get their performance from a tough 12.9L engine, to ensure quality through every step. Recognized for built-in quality, our 350 (kW) diesel generators meet an endless variety of business-critical applications. With exceptional support through our knowledgeable sales and service, you become part of the Generac team. Uncompromising 400 kW of power from a rugged 12.5L diesel engine, backed by Generac's more then 5 decades of manufacturing experience. Our heavy duty 15.2L engine is proven in a variety of industrial applications and delivers a predictable 500 kW. Generac's national industrial dealer network of factory-certified technicians provide expertise in everything from system design to diagnostics and repairs. With our products, failure is not an option.The 500kW diesel generator is available in SD (single unit) and MD (modular/paralleling) models. There are several standard, configured, and engineered options. It has a 6 cylinder engine and is available in a three-phase system. It has the power of 601-1735 amps. Open, standard, and level 1 or 2 enclosures are available options. A workhorse in the field, delivering 600 kW from an 18.1L engine, for applications from healthcare to educational facilities to data centers. Generac designs and manufactures key components in a vertically integrated environment, ensuring the highest reliability and quality standards. 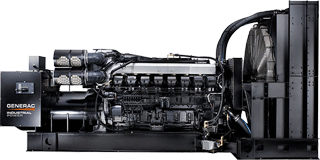 The generator engines can be easily serviced by a qualified diesel technician. Harsh environments are no match for this 33.9L engine providing significant power at 750 kW. 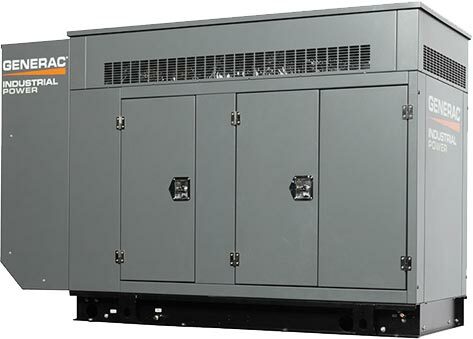 The genset is built to UL2200 standards. Diesel-fueled generators are the traditional choice for high kW projects, they feature a range of fuel tank sizes, are UL1429 listed from the factory, and a feature controllers that allow you to monitor conditions. Pumping out 800 kW the 33.9L engine is durable and reliable, and meets EPA emissions standards. 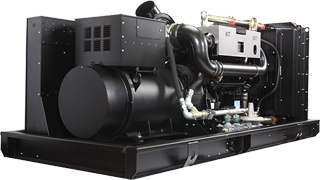 Our generators come with emissions compliant diesel engines and brushless alternators with permanent magnet generator excitation systems designed to work in severe environments. Our diesel generators are the workhorses of the industry, trusted to deliver the power, longevity, and reliabilty needed for the harshest environments. Our vertically integrated manufacturing ensures our generators meet the highest standards--yours. Every component of our generators is tested in our facility to ensure it meets UL220 standards. But your standards are the only ones that matter. Our diesel technology is proven over decades of performance and our support network is second to none. 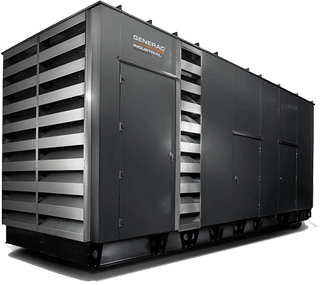 The two units are combined inside a single weather resistant and sound attenuated enclosure using Generac's exclusive PowerManager® control system. Up to seven Gemini gensets can be paralleled without additional switchgear, for a total output of up to 7,000 kW. Built with a strong 49L engine, this diesel generator provides the reliability and stamina to endure nature's worst as well as routine power outages. Designed and built in our own state-of-the-art facility, thousands of facilities are depending on our diesel generator technology every day--all day. Our market-leading support network can help you with sizing, specs, and installation. The sturdy 65.4L engine provides reliable power when you need it. Built dependable because every aspect of manufacturing and testing is done in-house. 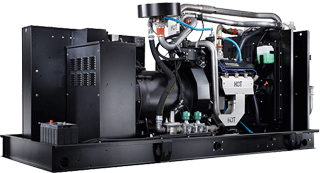 Efficient diesel power allows this 1500kW generator to be used for any application. Our cutting-edge manufacturing processes assure quality, control and most importantly the dependability of a single-source provider. Bigger is better. With 2000 kW of pure power, these generators are production tested to ensure durability and reliability. 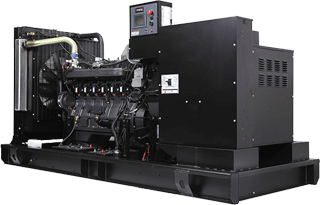 The 2000kW diesel generator is a single-source for all your components. When you specify your diesel generator, we build it with the alternator, enclosure, silencer, and circuit breaker for your application. No more searching for third-party providers to deliver the solution you need. Our Generac engines are built for endurance, so our 5.4L engines will give you the reliability you need in our compact 35 kW natural gas generators. .Small businesses have the same needs as larger ones--protecting sensitive customer data and staff members. Our natural gas generators provide the standby power you need, with easy maintenance, and they are environmentally-friendly. Reliability and power are built into all our Generac 5.4L engines providing 40 kW to meet the needs of many light industrial applications. Generac ensures superior quality by designing and manufacturing most of its generator components including engines, alternators, enclosures and base tanks, control systems and communications software. Run on natural gas or propane with our durable 5.4L engine, providing 45 kW of power. Our gaseous generators give businesses a variety of options, configurations, and arrangements, allowing you to tailor your backup power solutions to meet your needs. Our impressive 6.8L engines deliver the performance you need with 50 kWs for virtually any light commercial application. Computers, ATMs, and other electronics relying on power can adversely impact your ability to stay in business when an outage occurs. An investment in our responsive gaseous generators protect your product, data, and equipment investment. Small businesses need backup power as much as big businesses. You have equipment and inventory that needs to be safe-guarded, not to mention customer data that needs protection whether you sell online or not. 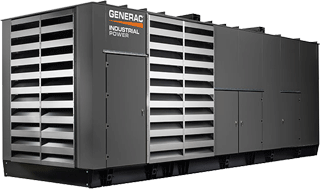 Go to the proven resource--Generac Industrial Power. Strength from rugged 6.8L industrial-grade engines providing 70 kWs of quality power. Revenue records, inventory numbers, employee information — all your important files live on your computer equipment. Our generators give you the backup/emergency power you need to stay connected. 70KW generators can meet the power needs of 65KW generator with only a small difference. Quick starting, rugged 8.0L Generac engines provide an abundant 80 kW for a variety of small businesses. The 80kW gaseous generator runs on either natural gas or LP with simple switching between natural gas and LP in the field. Our controllers provide you with current generator status, run time, and history. Durable and reliable, our 100 kW gaseous generators feature solid 9.0L engines to protect your property. You invest in security systems to protect your business. Our natural gas generators protect your security system, giving you the ultimate in peace of mind. 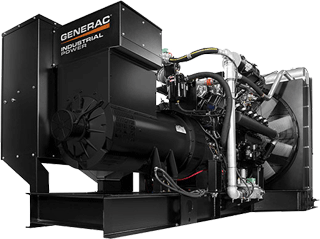 Long-lasting 9.0L Generac engines provide reliable 130 kWs of power for demanding applications. When you experience an outage, our gas generators keep your heat or AC running, and your cash registers and security systems on, allowing you to stay open for business. Supplying 150 kW of power, our natural gas generators featuring 14.2L engines can backup your investments in inventory and equipment. When you lose power during an outage or storm, our hard-working gaseous generators restore power in less than 10 seconds, putting you back in business. Our 250 kW gaseous generators provide ample power from proven14.2L engines, manufactured by Generac. 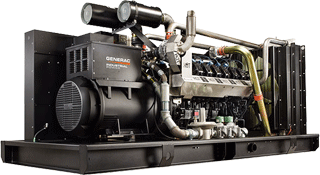 Generac manufactures a sturdy and dependable 21.9L engine that produces 350 kW to keep business-essential operations online. Whatever you need standby power for - whether it’s to keep a nursing home operating, a data center processing, or a factory producing - join thousands of other power solutions experts that have chosen to rely on Generac generators. 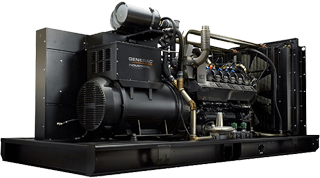 As the leaders in natural gas, these sizable 500 kW generators are powered by a reliable 25.8L Generac engine providing the ultimate in dependability. Due to its long run times, natural gas is becoming the preferred fuel choice in many applications. Our natural gas generators are built in-house and go through tough testing in our laboratory so you know they will deliver the needed power in the field. Industrial fuel system components, non-automotive, designed for large gas gens and optimized to work in a wide range of ambient temperatures.